These Country Potatoes make for a simple, minimalist side dish recipe that is fast and easy to cook, yet has the wonderfully distinct flavor of good old fashioned home cooking! A handful of ingredients are brought together in a perfect, hearty, comforting dish that pairs really well with steak, chicken or fish. In fact, they were so good that my family nearly gobbled them all up before I was able to snap a picture! 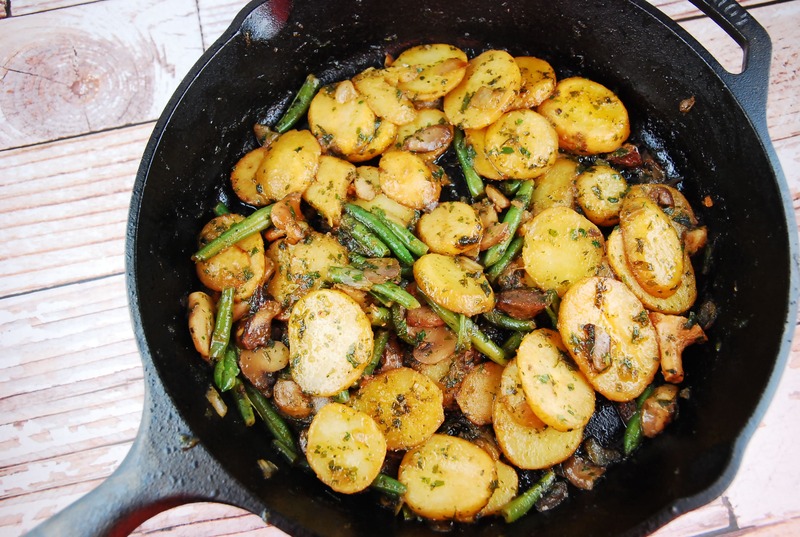 I love that these potatoes cook up so quickly, and the flavor of all the vegetables aren’t overwhelmed with seasonings or sauces, allowing them to really shine. I’ve also served these as my take on breakfast potatoes a few times too, and they were a real treat alongside some turkey bacon and eggs. At just 5 Smart Points per serving, you’ll get a seriously satisfying side to your favorite main course, without going overboard. A delicious side dish recipe that is sure to give any meal a homestyle feel. Tender, sliced potatoes are sautéed to perfection with fantastic flavor in this simple yet satisfying recipe. Place the sliced potatoes in a pot and cover with water. Bring the pot to a boil over high heat, then let simmer until the potatoes are tender, about 5 minutes. Drain the potatoes and set aside. Heat oil in a large skillet over medium high heat. Add in the garlic and sauté for about one minute, then add in the potatoes. Continue to sauté, stirring every few minutes, until they are mostly golden brown, about 8-10 minutes. Add in the green beans, mushrooms, and butter, and continue to sauté until the green beans are slightly softened, about 5 minutes. Season the with oregano, salt and pepper.